A former Coleg Meirion-Dwyfor student is celebrating his success at Bangor University’s graduation ceremony this week. 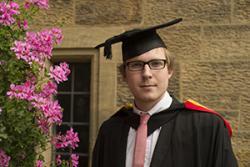 Elis Dafydd, 21, from Trefor, Caernarfon, graduated with a First Class Honours degree in Welsh. He was also awarded the Ellen Kent prize of £100 for his dissertation on intertextuality, literary references and tributes to Iwan Llwyd. Additionally, he has won the Sir John Morris Jones award of £100 for the student receiving the best results in his/her final year, and also one of the most prestigious prizes of the week, the Dr John Robert Jones prize of £800. This annual prize is awarded to the two best students across all disciplines and one to the best student from Wales from across all disciplines. Feeling a great relief to be graduating after three years of hard work, Elis said: "I feel very happy and proud that the hard work has paid off. "It was purely by chance that I came to Bangor, and as a result I have just experienced the happiest three years of my life. "I worked at Canolfan Bedwyr during the summer holidays of 2012 and 2013 and during my third year I worked as a peer writing mentor at the Study Skills Centre. It was very demanding and challenging at times, but I really enjoyed it as it was a great experience. "I was one of four participants in the Her100Cerdd challenge in October 2013 where four poets had to do their best to write 100 poems in 24 hours. "Since around March, I’ve been involved with the editing of the next issue of Tu Chwith - a Welsh literary magazine - in collaboration with another student from the School of Welsh. This edition - on the theme of 'enslaved / free' - will be available at the National Eisteddfod this year. During his time in Bangor, Elis was a Member of the Association of Welsh Drama. He was also on the editorial board of Y Llef, Bangor University’s Welsh language student newspaper; Elis was responsible for the Creative Corner and was a regularly contributed various articles and columns. Elis, who hopes to begin an MA course in September, said: "I would like to thank all the staff from the School of Welsh. They're great lecturers, they’re always available to give advice and support and very deserving of credit, praise, honor and prestige."